We all know by now how much i love a seaside kitchen so when i spotted this in Tescos 2 for 7 pound deal, it was a given and to be fair having read most of Jenny Colgans books and loved them i was expecting another sure fire hit. This time we meet Flora, who was born and bread on Mure, an idilyic little scottish island but fled as soon as she could. Moving away gave her chance to become someone no one knows and create a brand new life for herself. When her job calls for her to return to her home (at a major clients demands & her bosses wishes) she finds herself digging up memories and feelings that she no longer wants, i mean after all - everyone is whispering about her. Pushing all that aside and waiting to hear from her dreamy boss, Flora takes it upon herself to look after the dad and brothers she left behind and step into her mothers shoes and take up the cooking, as she soon discovered all the men were eating was sausages. Jenny Colgan has done it again - and created another fantastic summer read, with wonderful description that had you longer to book a trip to Mure just to see if the views were really as good as they are claimed to be. I wanted to feel the warmth of the kitchen and delve into some home made pie. Flora was a wonderful MC - she was keeping her feelings close to her chest, and i really wanted to know what had got everyone really whispering about her. The family had a real work ethic about them, and arguments around the dinner table - non of this falseness about them, that made you want to help them all out. Now as for Floras dream boat boss, well - after she was warned away from him, its really hard to stay away when he visits your home town and he needs a helping hand - is he really as cruel as he is in business all the time? Throw in a few dramas, a dog that thinks its younger than it is & well - you have the perfect way to spend a sunny afternoon. This was a great read and got me lost for a few hours. 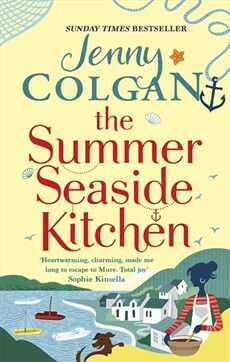 Jenny Colgan is the author of numerous bestselling novels, including The Little Shop of Happy Ever After and Summer at the Little Beach Street Bakery, which are also published by Sphere. Meet Me at the Cupcake Café won the 2012 Melissa Nathan Award for Comedy Romance and was a Sunday Times Top Ten bestseller, as was Welcome to Rosie Hopkins' Sweetshop of Dreams, which won the RNA Romantic Novel of the Year Award 2013. For more about Jenny, visit her website and her Facebook page, or follow her on Twitter: @jennycolgan.